Plasma Balls are novelty items that can be use to demonstrate scientific concepts. can stay connected to the point on the ball that you are touching. warning those with any type of heart condition. you hold the bulb at one end, the entire bulb should light up. 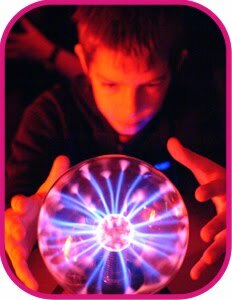 What to say: The plasma ball is the same concept as the Van de Graaff generator. discharges electricity from a small center ball to a larger surrounding sphere. electricity is passed through it. seconds, the excited atoms will return to their normal energy states. 1. Turn off the lights so that you can see the plasma ball glowing. 2. Put your hand on the plasma ball. What happens? 3. Now bring the fluorescent light tube close to the plasma ball. What happens? 4. This step requires a friend, so have one close by and ready to help. Stand on the chair or stool and put your hand on the ball. Now have your friend hand you the light tube. Do you see it light up? What happens if your friend lets go? Be careful to not touch the ends of the light tube – it gets hot! 5. Put a penny on the top of the plasma ball. Carefully touch the penny with another penny. Don’t use your finger – you’ll get a shock! The plasma ball is a miniature Tesla coil. Inside the ball is a coil of wires that have electrons going through them oscillating at a very high frequency. This shakes the atoms around the wires so hard that their electrons start to fall off! Inside the glass globe is a partial vacuum. This just means that some of the air has been sucked out. Because there is not as much air in there, it is easier to make electric sparks that can be seen. What happens when you put a fluorescent light bulb next to a plasma ball?